They’re bulky, springy, and a challenge to compress, making them notoriously hard to discard. Mattresses have long been the bane of landfills, where they take up a disproportionate amount of space. Their metal coils also damage shredding equipment that breaks up trash before it’s burned at incinerators. Now, with landfills in Massachusetts rapidly running out of space and municipalities paying higher prices to dump their garbage, environmental officials are prodding cities and towns to recycle many of the estimated 600,000 mattresses that state residents trash every year. “We want municipalities to treat mattresses like recycling an aluminum can, so they see why it would be a waste to throw them away,” said Greg Cooper, who oversees recycling for the state Department of Environmental Protection. About 85 percent of the contents of a mattress and its box springs — the coils, foam, cotton, wood — can be recycled. In an effort to spur a new recycling market and to save municipalities money, environmental officials soon plan to announce about $500,000 in grants to help cities and towns start mattress-recycling programs. This summer, they signed contracts to pay three companies up to $13 per mattress to collect the old beds and recycle them. About two-thirds of the state’s discarded mattresses are now collected and shipped out of state by companies that deliver new beds to customers and take away their old ones. That leaves about 200,000 a year unloaded at the state’s landfills and incinerators, officials say. Within five years, they expect at least 50,000 of those to be recycled in Massachusetts. As many as 20 million mattresses and box springs are discarded every year in the United States, about half the number that are sold, according to the Mattress Recycling Council, a Virginia-based nonprofit created by the mattress industry. Mattress companies used to burn old beds in bonfires. Now, they dispose of about half of their old mattresses in incinerators or ship them to states with less-expensive landfills. They refurbish the rest for resale or donate them to charities. 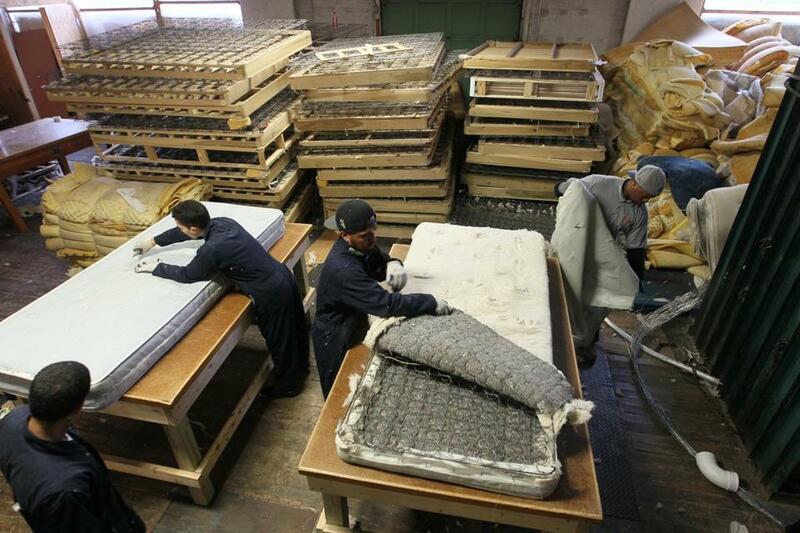 In recent years, states have pushed companies to recycle more of their old mattresses. In May, Connecticut became the first state to require companies to collect a fee on every sale of a mattress or box spring to subsidize a statewide recycling program. Next year, California and Rhode Island will start similar programs, and other states are considering comparable laws. “The mattress industry has been looking at recycling for a long time, but it’s taken a while to get to the point where the cost of the labor to break them down makes sense,” said Amanda Wall, a spokeswoman for the Mattress Recycling Council. Recycling companies face significant costs. Officials at UTEC, one of the three contractors hired by the state, said they would need to recycle 40,000 mattresses to break even. That is many times more than they collected last year, when UTEC started its program and lost money. The nonprofit youth organization expects to break even by 2017, especially if it can expand its supply by working with colleges, hotels, and hospitals. “We think it’s the right thing to do for the environment, while providing meaningful jobs to our young people,” said Gregg Croteau, executive director of UTEC. In Massachusetts, officials hope the grants and new contracts will generate enough volume to make mattress recycling a viable business and boost the state’s relatively low recycling rate. The state recycles only about 45 percent of its commercial and residential waste. They expect cities and towns to recognize the financial benefits of recycling, especially because landfills charge a premium for dumping bulky items like mattresses. Recycling more mattresses would also help curb greenhouse gases, according to a 2012 study by the State of California. Most of that environmental benefit comes from reusing the metal springs as scrap metal, converting the polyurethane foam into carpet padding, and shredding the wood frames of box springs into mulch. Massachusetts has some of the highest solid waste disposal rates in the country — between $55 and $80 a ton, compared with a national average of $45 a ton — and the fees are expected to rise as landfills run out of space. 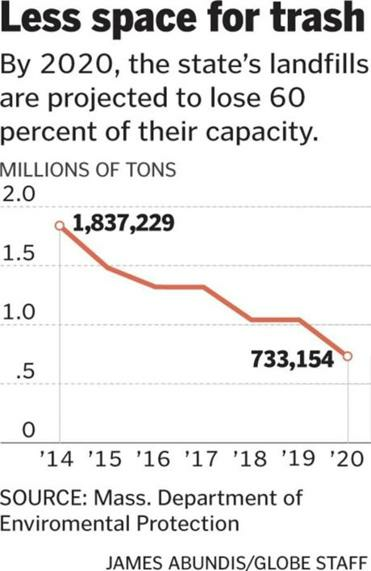 In just the past three years, the state’s landfill capacity has dropped nearly 30 percent. Over the next five years, state officials expect the landfill capacity to drop by more than half. Cambridge is one of the nearly 50 municipalities in Massachusetts that have sought one of the state grants to set up a mattress recycling program. Officials there hope to cut thousands of dollars from their trash costs by recycling an estimated 2,500 mattresses and 1,250 box springs a year. Like much of the area, Cambridge experiences a surge in discarded mattress at this time of year, when students return and many rental apartments change hands. Residents are allowed to throw out one mattress a week, which garbage trucks haul away with the rest of the trash. If they receive a state grant, the money would pay for their recycling program for two years, at most. Afterward, officials plan to charge residents $25 to trash mattresses, as they do with refrigerators and other bulky waste, said Randi Mail, the city’s recycling director. One of the state’s first mattress recycling programs has been running since last year in Newburyport, where an average of 35 mattresses a month are recycled. City officials expect to save an estimated $4,000 this year. The city charges residents $10 to have a company collect mattresses from outside their homes or at the city’s recycling center. Residents are charged $15 for trashing them. Now, Newburyport recycles nearly twice as many mattresses as it sends to landfills. Workers at the Lawrence facility of UTEC, a nonprofit youth organization, must take apart mattresses in order to prepare them for recycling.